A friend of mine left me a voicemail the other day. I’ve been in that spot where I like the idea of a project more than I like actually doing the creative work. Because it absolutely is W-O-R-K.
That’s not to say it’s miserable work. If we didn’t enjoy it, we wouldn’t do it. The key to not being overwhelmed is confidence. The key to confidence is having some past victories. Kind of a catch-22, ain’t it? 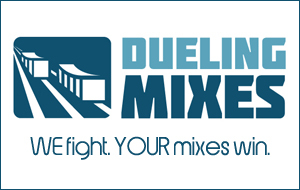 That’s why things like Dueling Mixes exists. You have a song to mix by the end of the month, but you don’t have to deliver it to a client or play it for anyone else. You have the freedom to get in there and go for it. If you fail, no one has to know. …and find that confidence and excitement you’ve been looking for.